Edenton and Chowan County are the exception: The downtown is alive, jobs are available; and housing and living cost are below state and national averages. Developers are looking to bring a Senior Living Community to town, as well as an additional grocery store and there is demand for new or renovated single-family housing. Local businesses are expanding: Regulator Marine has significantly added production area, as has Jimbo’s Jumbos (peanut processing) and Colony Tire has a new large facility under construction. Daedalus Boats, a high tech manufacturer of an 80′ catamaran is developing cutting edge eco-friendly technologies for cruising the globe in a factory they occupied recently in the Partnership’s Industrial Park near the 7,000′ runway airport. To meet the growing needs of Edenton and Chowan County, the Partnership is helping recruit employees, investors in commercial or residential properties and volunteers interested in supporting schools, hospital and the numerous historical sites that make Edenton a special place to live with a lifestyle not found in other places. A recent UNC posting reports the new “… Opportunity Zone (OZ) program was created as a part of the federal Tax Cuts and Jobs Act of 2017. An overview of the program previously posted on the CED blog can be found here. 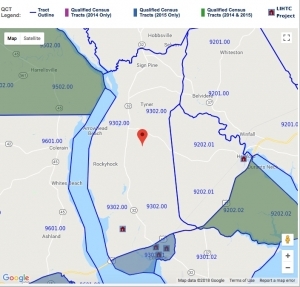 On May 18, 2018 the US Secretary of Treasury certified 252 census tracts in North Carolina as OZs. The designation of OZs allows investors to gain tax benefits through investment in business activities – including real estate – in the certified zones. Looking for office, retail, factory or warehouse space? Contact the Partnership’s Executive Director, Mallory Denham (MalloryDenham@edenton.net) or (252) 482-2007, and he’ll provide information about our Industrial Parks, as well as privately-owned properties within Chowan County. They range from office space above Town Hall, retail space on Braod Street (our Main Street), to very large warehouse buildings, heavy industrial river frontage or parcels with highway or waterway access. Areas for development exist within the new federal tax law’s Opportunity Zone within Chowan County. Developers interested in pocket-neighborhood development, senior living facilities, apartments or condominium will find Mallory has the information or will put you in touch with the right folks. Local realtors also know of great opportunities around the county. Employers can also list jobs on the College of Albemarle’s web site and job seekers can see job posting there as well. Looking for work: review the jobs available? Employers seeking good employees, click the sign-up button to open an account or add a new job listing. A great way to become fully engaged in Edenton is to volunteer with local churches, the hospital, library, schools or with the many historical and civic organizations. 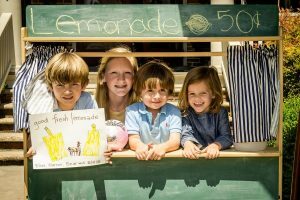 Not to mention that ever now and then, a little help is needed with the Lemonade stand. Contact these folks to learn more about their opportunities. Barker House Welcome Center – open 7 days a week, volunteers, supported by a small paid staff, greet visitors and answer questions about the home of Penelope Barker, leader of the first political action by women, the Town Trolley, the Historic Chowan County Jail and (the most recently added site) the Oldest House in North Carolina (open only for academic research). The Cupola House & Gardens – open on weekends and special occasions, volunteers do everything without paid staff support ranging from weeding the gardens, a big job, to researching the structure and previous residents of this 1758 colonial structure, restored to its original condition, colors and materials. Historic Edenton State Historic Sites – This NC State-operated group of Edenton sites has paid staff supported by volunteers greeting visitors at the Iredell House, the 1767 Historic Courthouse (the oldest in-use courthouse in America), the 1886 Roanoke River Lighthouse (one of the last remaining screwpile lighthouses) and supports the operations of the Town Trolley Tuesday – Saturday, 10am – 4pm. Vidant Hospital at Edenton – Volunteers fill a variety of roles, from interacting with patients to helping families find their way around the hospital. Some volunteers use their skills and training to assist with administrative work or serve as lab assistants or nursing aides. Chowan County Schools – Volunteers undergo a background check and then work in a variety of areas within the county’s school system. From Book Buddies (a reading program) to helping with coaching, and many more, all talents are needed. Chowan Arts Council – Locally known as CAC, welcomes volunteers willing to assist the CAC in day-to-day operations. You do not have to be an artist, just a lover of art. Stop in or give us a call at 252-482-8005. Volunteers are the heart of our existence!